A wasp dared to enter the observation hive and had a torrid time as a result. I watched the hive on-and-off for at least two hours as the wasp was chased around the hive having tussles (like this one in the photograph) along the way. Eventually the wasp was trapped with its head hanging over a bottom bar and its body above it as the bees explained that its presence in the hive was unwelcome. I last saw the very disoriented and clearly injured wasp in the plastic exit tube being brushed aside as the bees went about their business. It was so confused — or perhaps drawn by the smell of honey — that it would try to go back towards the hive when the bees rushing passed it allowed it to move anywhere. I didn’t see its final and inevitable demise. I wonder how long it actually underwent its harassment and am surprised that it wasn’t actually killed outright, just mortally wounded. A “possible” siting of an Asian Hornet near Maidstone in Kent, south east England, has been reported by the UK National Bee Unit (NBU), a government agency. The NBU has described the reports as “credible” but following a field investigation by a local bee inspector “has not been able to verify the report”. Asian Hornet. Picture courtesy: C Villemant, A Perrard, Q Rome, O Gargominy, J Hazaire, E Darrouzet & A Rortais. 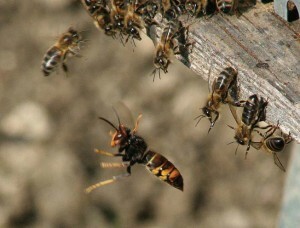 Vita first reported on the Asian Hornet, Vespa velutina nigrithorax, threat in 2010. The Asian hornet was first identified near Agen in France in 2004 and is thought to have arrived in Bordeaux from China in a consignment of pottery. 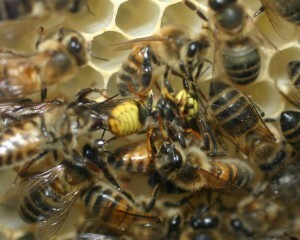 By 2007 apiaries around Bordeaux were suffering up to 70% colony losses. Since then it has been spreading at a rate of about 100km each year into neighbouring countries and further north in France. In June, we reported that it had been seen in Italy. There has been an expectation that it would reach south or south east England at some point. Asian hornet nests are hard to spot until the leaves fall from their nesting trees in autumn. But the damage they do is unmistakable: groups of five to 50 hornets hover in front of a hive, picking off single honeybees, decapitating them and stripping off their wings and legs before making off with the “meat ball” to their nest to feed their young. As the attacks continue, the honeybee colony stops flying and has to consume its own stores, eventually weakening it to such a point that an invasion force of many hornets enters the hive to rob it out. Vita has been working on a trap for the Asian hornet and soon will have had its first limited production run for France where the Asian Hornet problem is at its most acute. Does your national government help your honeybees? The frenzy is well underway in European Union countries as governments finalise their plans for the upcoming funding cycle for honeybees and beekeeping. In September, the EU is expected to approve each Member State’s national programme for support of the beekeeping sector. The coming three-year cycle runs from 2014 until 2016 and is intended to cover areas including Varroa control, applied research, technical assistance, laboratory support, migratory beekeeping and the restocking of hives. I think it’s worth looking at the different approaches taken around the continent. Provided they fit the broad areas (listed above) outlined in Article 106 of the relevant EU Directive (here, if you’re interested), governments are free to allocate the funding as they choose. In practice, approaches tend to fall into three groups, outlined below. Here in the UK, beekeepers don’t get a whiff of EU funding. Anecdotal evidence suggests that it is simply allocated straight to FERA, who provide support for the beekeeping sector in the form of the excellent National Bee Unit and our network of regional bee inspectors. Other countries adopting a similar approach include Ireland, Sweden, Holland and Denmark, all of whom plough the EU subsidy directly into research programmes. While research into bee health is clearly vital, what irks some beekeepers is that it can appear that work is simply being carried out for its own sake. Perhaps commercial organisations (with Governmental support) are better placed to carry out at least some of this research, given the clear imperative for a return on their investment. Many Central and Southern European Member States like Germany, Hungary, Lithuania and Slovenia, as well as Portugal and Italy, new Member Croatia and Accession candidate Montenegro use their EU funding to subsidise Varroa control. This has the dual benefit of aiding the fight against ‘enemy number one’ while incentivising a national register of beekeepers. This register could be considered a vital tool to track the spread of disease or pesticide resistance and cut down on rogue practices. As @SheffieldHoney pointed out on Twitter recently, in the UK one requires a licence to catch a single fish but not even a cursory check to keep millions of bees! Implementation of this strategy varies from subsidising the cost of Varroa treatments on an ‘approved list’ to handing out product free of charge but the key continuum is that support is given to registered colonies only. France is unusual in allocating funding to almost all of the areas covered by the EU directive, at least to some degree. France uses their budget to subsidise Varroa control, as well as for the rationalisation of seasonal migration, supporting research labs, restocking colonies and providing technical assistance. Interestingly, a crude look at colony loss data (the figures I used relate to 2009-2012) would imply that the second approach leads to lower overall losses. It will be intriguing to see what happens when the national programmes are publicised next month. We already know, for example, that Slovenia is moving away from a system whereby every registered colony in the country received free treatment but the beekeeper had no choice of product – only one product was offered and the overwhelming criterion for the choice of product was lowest price, rather than effectiveness or ease of use. We hope governments will see this round of funding as an opportunity to get support to where it really counts. The feeder in place. Empty again but there are still bees investigating it. I’ve often heard it said by experienced beekeepers that feeding bees sugar involves a lot of waste because the bees get so excited they consume lots jut by being excited. And now I have seen evidence of that in the observation hive. I had to replace the original super frames because they were becoming so full. As soon as the flow ended the bees rapidly consumed the little that was stored in the replacement frames. It happened with frightening speed and I think I just started feeding in time. They quickly consumed the first kilo of sugar syrup — but there isn’t much to show for it in the way of stores in the comb. In fact I can’t really see any! But oh did they get excited! I think it all vanished in their sugar rush. It just goes to show how closely an inevitably undersized colony in an observation hive needs to be monitored. I’m lucky enough not to have to feed my apiary bees in the autumn. I used to feed them, but never enjoyed the messy process. So now I make sure — one way or another — that they have plenty of honey stores to take them through winter and watch closely to make sure they have enough in the dangerous months of March and April when lots of stores are needed to feed the developing larvae. Now that the honey flow is coming to a close, it is time to treat for varroa mites. Anecdotal reports from northern Europe suggest that varroa mite populations may be relatively low this season, but it is vital that beekeepers are not complacent. It could be that sustained and regular treatment with approved products over several years is having regional or even national impacts and it is therefore extremely important that those treatments continue. 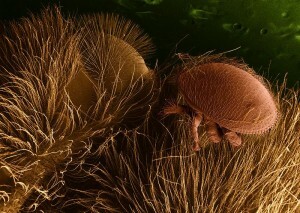 Close up of a varroa mite on a honeybee. Photo courtesy BetaTec. Dr Max Watkins, Technical Director of Vita (Europe) Ltd, explained: “Initial anecdotal reports in northern Europe suggest that varroa populations may be relatively low this season, but we would like to hear many more reports before we can be sure of that. “If these reports are representative, it could be the result of two factors. Firstly, the late spring may have delayed the breeding of varroa, just as it delayed the development of honeybee colonies. “But, secondly, it could also be that sustained treatment with regulated products over many seasons is inhibiting the development of large varroa mite populations over the longer term. We know that there are few feral colonies around now to act as reservoir for varroa mites and that some beekeepers have lost colonies through inadequate or no varroa control management. The safest way to proceed is clear: treat regularly using approved IPM products and methods. In the Vita product portfolio that means treating each season alternately with Apiguard and Apistan — where there is no resistance to the active ingredient of Apistan. 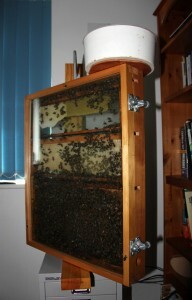 Although there has been evidence that regionally some colonies have become resistant to fluvalinate, the active ingredient of Apistan, and some other first-generation varroa control products, there is also evidence that Apistan is becoming effective again in areas which have not used Apistan for a number of seasons. There is a quick rule of thumb test for resistance to Apistan here on the Vita website.